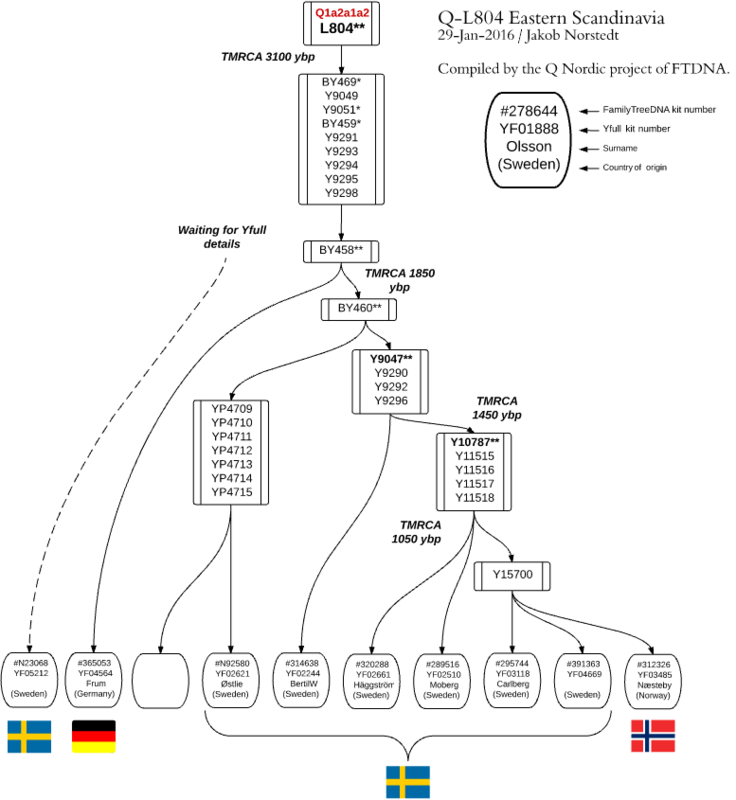 Q-L804 is one of the two subclades forming the Q Nordic project (the other is Q-L527). Q-L804 is very independant. It’s closest neighbor clade is Q-M3 but their most recent common ancestor lived about 15,000 years ago. Q-M3’s members have Native American ancestry. Just a little further away is the Q-Z780 subclade which also has members of Native American ancestry. The Anzick-1 boy buried in Montana, USA, 12,600 years ago and found in 1968 belonged to Q-Z780. 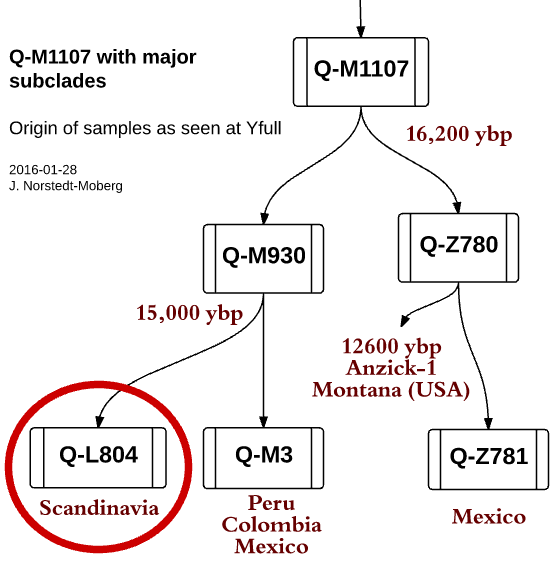 As far as we know now (data from Yfull), contemporary members of Q-M3 have an origin in countries like Peru, Colombia and Mexico and contemporary subclades of Q-Z780 are found in Mexico. The branches all have a common ancestor who lived about 3100 years ago. There are about the same number of kits in each branch. The known ancestors of the tested kits indicate different histories of the branches. The three Q-L804 branches. 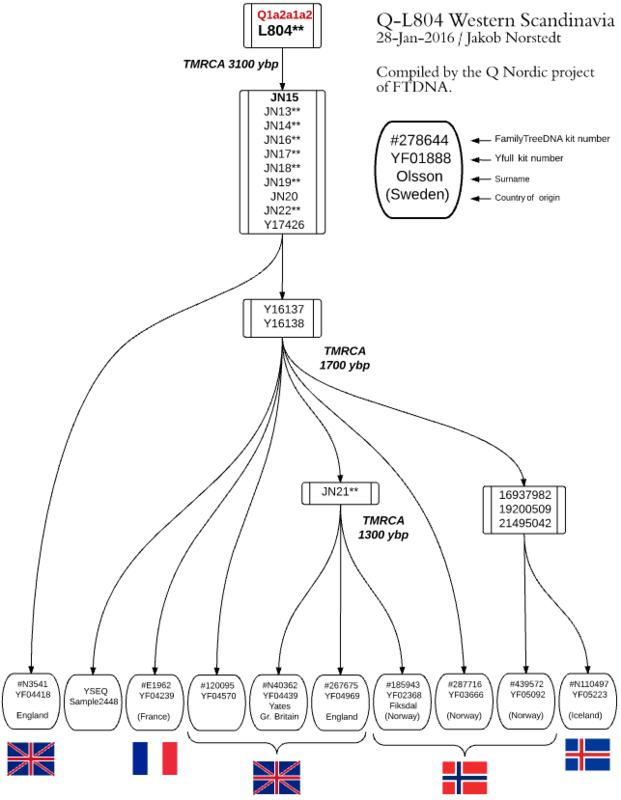 Origin of BigY kits with known ancestry. 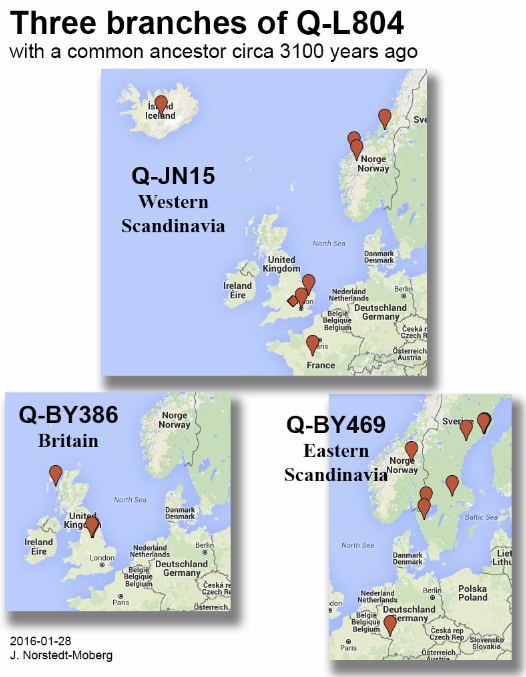 The branch defined by the SNP JN15 has members with ancestry from western Norway, Iceland, Britain, and France. 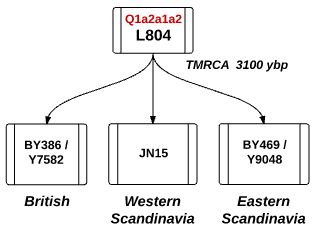 The Western Scandinavia branch of Q-L804. It seems reasonable to think that the diversity of nationalities reflects an expansion from Norway by Vikings and/or Normans. The Icelandic kit splits from the others a little later and has it’s genetically closest cousin in Geiranger, Møre og Romsdal, Norway. The British branch, defined by the SNP BY386, has kits from England and Scotland. In this branch there are also kits from USA with unknown but supposed British origin. The British branch of Q-L804. MacSwain, the Scottish kit at the far right of the chart, is the first to split from the others. 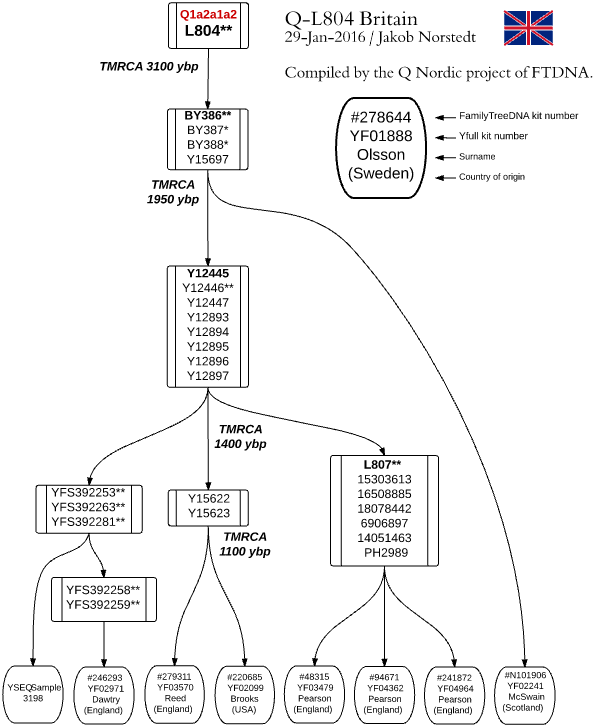 Three tested kits with the surname Pearson is a part of this subclade. They are not yet fully analyzed at Yfull. The branch defined by the SNP BY469 has most of it’s members in Sweden. The Eastern Scandinavia branch of Q-L804. There is also a kit with German ancestry (surname Frum) and a kit from Hedmark in Norway close to the Swedish border. Detta inlägg postades i English, Q Nordic och märktes L804, Q-L804 den 29 januari, 2016 av Jakob Norstedt. Stjärnasläkten från Kopparberget och Forsgren från Älvkarleby?